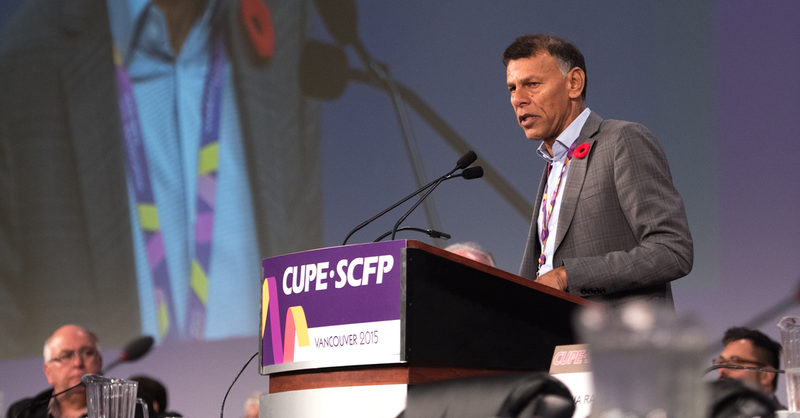 The next four years present an opportunity to build the Canada we want, Canadian Labour Congress President Hassan Yussuff told CUPE Convention delegates. While the outcome of the election may not have been ideal, it did end a decade of rule by a prime minister who used racism and xenophobia as an election tool, who attacked unions and who moved human rights backward a decade. In the next four years, we must hold Justin Trudeau to his promises to repeal Bill C-377, to begin an inquiry into missing and murdered aboriginal women and to restore card-check certification. We must convince Trudeau to repeal, not revise Bill C-51, he said, adding that we must prioritize electoral reform so everyone’s voice counts and we don’t end up with huge majority governments representing a minority of Canadians. He closed by calling on CUPE members to leave Convention united and stronger.